1. )The Novice. Don’t worry, everyone needs to start somewhere. As you will quickly learn there are a lot of key words and phrases that are used in this industry. Do not get flustered if you don’t know the difference between a webcast and webinar…it’s okay, we’ve all been there. Chances are you’re looking for a platform that is quick to set up and easy to use. Onstream Meetings Free might be exactly what you are looking for. 2.) The Tech Savvy IT Manager. You’ve been in the IT game for a long time now. Nothing gets past you and your department that doesn’t meet their demanding standards. If it isn’t secure, reliable, and complimented with 24/7 support, you don’t want it anywhere near your office. Well luckily for you Onstream Webinars just may be your solution. Onstream Webinars is 128 bit SSL encrypted and comes with RTMPE (Real Time Messaging Protocol Encryption) for added security. The 100% browser based and download free platform makes it easy for the entire office to use. That way you can focus on something other than your web conferencing solution. When you do run into any questions, Onstream Media is there to help, always. With 24/7 support your questions will never go unanswered. 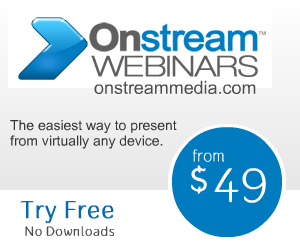 To sign up for a free 30 day trial of Onstream Webinars click here. 3.) “My Boss Told Me to Find A Webinar Provider and Now I’m Here” Welcome to the club! You are definitely not alone. Maybe you have had some experience with web conferencing before or perhaps you are just testing out different platforms for your company. Whichever the case, Onstream Webinars is a great solution for you. Need customized branding? Registration page? Screen sharing? Chat? Polling? Q&A? Whiteboard? Recordings? Well with Onstream Webinars, you’ll easily find all of these features plus many more. The best part is you can test Onstream Webinars free for 30 days. No credit cards required. Click here to register for your trial.